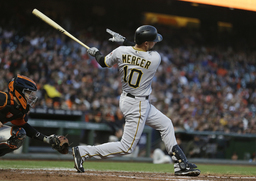 DETROIT (AP) Jordy Mercer found out quickly that the Tigers had him on their radar. While other teams have proceeded more slowly this offseason - perhaps waiting to see how the bidding goes for stars like Bryce Harper and Manny Machado - the Tigers have moved fast. So have the Texas Rangers, who have already added free agents Lance Lynn, Jeff Mathis and Jesse Chavez. The Rangers are also coming off a last-place finish. "I try to play as many games as I can," Mercer said. "I try to be consistent - no highs, no lows."